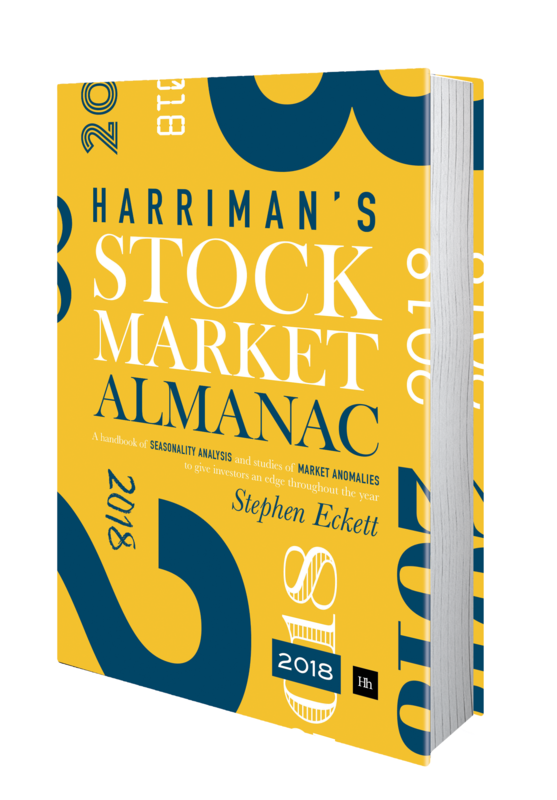 FT30 Index 1935 – Where are they now? The FT30 Index was started by the Financial Times on 1 July 1935. Today the most widely followed index is the FTSE 100, but for many years the FT30 (originally called the FT Ordinaries) was the measure everyone knew. The table below lists the original companies in the FT30 Index in 1935 – a time when brokers wore bowler hats and share certificates were printed on something called paper. It’s interesting to see what became of the stalwarts of UK plc from over 60 years ago. Associated Portland Cement The name was changed to Blue Circle Industries in 1978, and then left the index in 2001 when it was bought by Lafarge. Austin Motor Left the index in 1947. In 1952 Austin merged with rival Morris Motors Limited to form The British Motor Corporation Limited (BMC). In 1966 BMC bought Jaguar and two years later merged with Leyland Motors Limited to form British Leyland Motor Corporation. In 1973 British Leyland produced the Austin-badged Allegro… [the story is too painful to continue]. Bass Left the index in 1947. In 1967 merged with Charrington United Breweries to form Bass Charrington, In 2000 its brewing operations were sold to Interbrew (which was then instructed by the Competition Commission to dispose parts to Coors), while the hotel and pub holdings were renamed Six Continents. In 2003 Six Continents was split into a pubs business (Mitchells & Butlers) and a hotels and soft drinks business (InterContinental Hotels Group). Bolsover Colliery Left the index in 1947. The mines were acquired by the National Coal Board on nationalisation in 1947. Bolsover Colliery closed in 1993. Callenders Cables & Construction Left the index in 1947. Merged with British Insulated Cables in 1945 to form British Insulated Callender’s Cables, which was renamed BICC Ltd in 1975. In 2000, having sold its cable operations, it renamed its construction business Balfour Beatty. Coats (J & P) Left the index in 1959. Traded as Coats Patons Ltd after the takeover of Patons & Baldwins, then as Coats Viyella, finally as Coats plc. Finally taken over by Guinness Peat Group in 2004. Courtaulds Demerged its chemical and textile interests in the 1980s, with the former eventually being bought by Akzo Nobel and the latter by Sara Lee. Left the index in 1998. Distillers Purchased by Guinness in the infamous bid battle of 1986 when it left the index. Dorman Long Left the index in 1947. Joined British Steel following nationalisation in 1967. Dunlop Rubber Left the index in 1983, and was then in 1985 bought by BTR (which became Invensys). Electrical & Musical Industries In 1971 changed its name to EMI and later that year merged with THORN Electrical Industries to form Thorn EMI but then de-merged in 1996. In 2007 EMI Group plc was taken over by Terra Firma Capital Partners but following financial difficulties ownership passed to Citigroup in 2011. Fine Spinners and Doublers Fell out of the index in 1938, and was later bought by Courtaulds in 1963. General Electric General Electric was re-named Marconi in 1999, suffered disastrous losses in the dot-com crash and was bought by Ericsson in 2006. Guest Keen & Nettlefolds Guest Keen is better known as GKN, and is still in the FT30 today. Harrods Left the index in 1959 when it was bought by House of Fraser, and then later by Mohamed Al Fayed. Hawker Siddeley Left the index in 1991, and was then bought in 1992 by BTR (which became Invensys). Imperial Tobacco Still going strong. International Tea Co Stores Fell out of the index in 1947, was acquired by BAT Industries in 1972 and ended up as Somerfield in 1994. London Brick Replaced in the index by Hanson which bought it in 1984. Murex Left the index in 1967 due to “poor share performance”. Acquired by BOC Group in 1967. Patons & Baldwins Left the index in 1960 when bought by J&P Coats. Pinchin Johnson & Associates Left the index in 1960 when bought by Courtaulds. Rolls-Royce In 1971 RR was taken into state ownership, the motor car business was floated separately in 1973, and RR returned to the private sector in 1987. Tate & Lyle Still going strong, although its sugar refining and golden syrup business was sold to American Sugar Refining in 2010. Turner & Newall Left the index in 1982. The company was heavily involved with asbestos production, so it is not surprising that things ended badly. In 1998 the business was acquired by Federal-Mogul, which soon after filed for Chapter 11 protection as a result of asbestos claims. United Steel Left the index in 1951. The iron and steel works on nationalisation became part of British Steel Corporation (and now part of Tata Steel); while the mining interests passed to the National Coal Board (now closed). Vickers Left the index in 1986. Bought by Rolls-Royce in 1999. Watney Combe & Reid Left the index in 1972 when it was bought by Grand Metropolitan, which itself became part of Diageo. Woolworth (FW) Left the index in 1971. Bought by the forerunner of Kingfisher in 1982, and then de-merged and re-listed in 2001. But the remaining Woolworth’s stores all closed by January 2009. Of the 30 companies only four exist today as listed companies: GKN, Imperial Tobacco, Rolls-Royce and Tate & Lyle. All of which today are in the FTSE 100 Index, except Tate & Lyle which bounces in and out of the index quite frequently, and is currently out. Only GKN and Tate & Lyle are in today’s FT30 Index. The star performer from the original line-up has been Imperial Tobacco. It’s interesting to note the complete lack of representation in the 1935 FT30 of banks, telecom, oil or drug companies - the four sectors that dominate the UK market today. The FTSE 100 Index was launched on 3 January 1984. The market capitalisation weighted FTSE 100 index replaced the price-weighted FT30 Index as the performance benchmark for most investors. The following chart shows the price performance of the FTSE 100 Index 1984-2013. A simple linear trendline has been added. The index was launched in 1984 with a value of 1000 and closed 2013 at 6749. This is an increase of 575% over the 30 years, giving an annual growth of 6.57%. The trendline calculates a value of 6695 for the end of 2013, which is just 54 points away from the actual value (less than 1% difference). 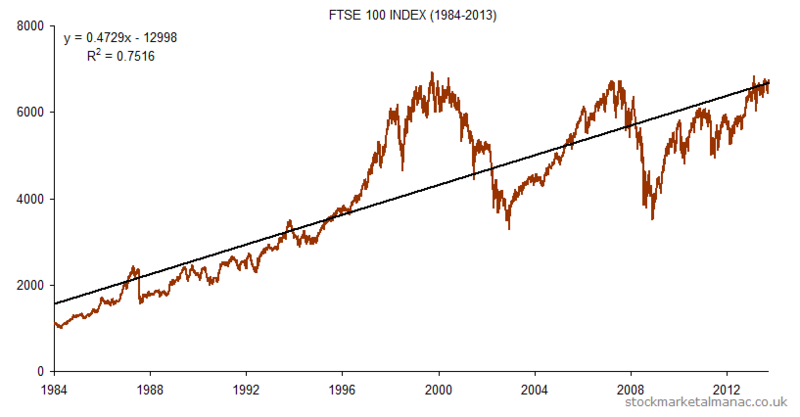 As can be seen in the chart, the FTSE 100 Index is pretty much bang on its long-term (since 1984) trend. The following table compares the market capitalisations of the top five largest companies in the index in 1984 and today. Oil is still there today, but industrial, chemical and retail stocks have been replaced by bank, telecom and pharmaceutical stocks. In 1984 the total market capitalisation of the index was £100 billion; at the end of 2013 the market capitalisation had grown to £1,824 billion. It’s interesting to note that Shell’s market cap. today is 40% larger than the whole FTSE 100 Index in 1984. FTSE 100 at 30 article in the Telegraph by Martin Vander Weyer. The 2013 edition of the Almanac looks at the historic monthly performance of the FTSE 350 sectors. Here we look at the Automobiles & Parts sector. The following chart plots the average out-performance of the FTSE 350 Automobiles & Parts sector over the FTSE 100 Index by month since 1999. For example, since 1999 on average the Automobiles & Parts sector has out-performed the FTSE 100 Index by 2.8 percentage points in January. NB. This sector has only one constituent (GKN). The strongest months of the year relative to the market for the sector have been January and February, the sector has only under-performed the market in three years since 1999 in this January. The sector has been relatively weak in September and October, the the sector has only out-performed the market in five years since 1999 in September. On this day in 1946 GKN listed on the LSE. The following chart plots the average monthly out-performance of the shares over the FTSE 100 Index since 1988. For example, on average GKN has out-performed the FTSE 100 by 3.3 percentage points in September. The strongest month for GKN shares relative to the market has been September (the shares have out-performed the market in this month in 17 of the last 25 years). The weakest month for GKN relative to the market has been December (the shares have only out-performed the market in this month in 6 of the past 25 years). GKN is in the FTSE 350 Automobiles & Parts [NMX3350] sector.